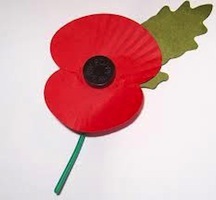 The tradition of wearing a poppy on one’s lapel to honor veterans of war dates back to just after World War I. A Canadian physician, Lieutenant colonel John McCrae, had penned a poem after presiding over the funeral of a friend who had been killed in the Battle of Ypres, where over 120,000 casualties were estimated. The new graves of the many young men who had died stretched on through a field of bright red poppies, and his poem, in Flanders Fields, used the flowers as a metaphor for the spilled blood of war. Published back in London in 1915, the poem quickly became the most popularly recited verse of its era and the red poppy the symbol for the great sacrifices of the armed forces. In 1919, exactly one year after the war ended, November 11th was designated as Remembrance Day (in Commonwealth countries) by King George V and Veteran’s Day in the United States, to honor members of the armed forces- particularly those that gave their lives in defense of their country. The red poppy was worn in recognition of the holiday, but since November is not the typical season for this summer flower, most are made out of paper. If you’d like to honor the service of veterans, past and present, with a fresh flower instead of paper, consider the following blooms that make excellent boutonniere’s to pin to the lapel on this day of remembrance. Said to symbolize gratitude in the language of flowers, dahlias are still in season in late autumn and are dazzling in both their symmetry and sturdiness. 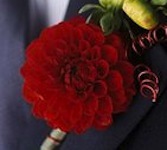 They come in deep reds with petals that are perfectly placed to form a round, solid bloom that will look fresh all day. They are easy to find at a local florist this time of year and will last much longer than an actual fresh poppy, whose delicate petals are likely to fall off rather quickly. 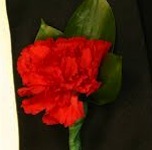 Both easy to find and economical, the carnation is the perfect flower to pin to a lapel. As a corsage or boutonniere, it can last for days without wilting and its true red color comes the closest to mimicking the sanguine hue of the Flander’s poppy. Said to symbolize admiration in the language of flowers, the carnation is the perfect way to decorate a serviceman or woman. Harder to find than dahlias or carnations, but just beginning to bloom in November, these flowers look very similar to the Flander’s poppy. 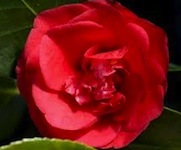 Said to symbolize gratitude as well, camellias are the perfect way to say thank you to a veteran.